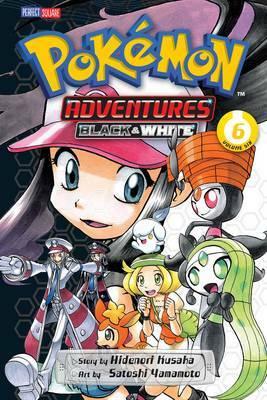 Pokemon Trainer Black meets White, a Pokemon Trainer who runs a growing talent agency for performing Pokemon. Will Black catch show biz fever too? Meanwhile, mysterious Team Plasma is urging everyone to release their beloved Pokemon into the wild! Team Plasma launches an all-out attack on the Nacrene Museum! What will they steal and who will they kidnap...? Black undergoes grueling training to prepare to fight the Legendary Pokemon Zekrom. And White's new battle skills are put to the test when Bianca needs help protecting an innocent Pokemon. Then, flash back in time to see the first spark of Black's dream to become the Pokemon League Champion... HOW DID BLACK CAPTURE HIS FIRST POKEMON...AND WHO WAS IT?